The Plaza Shopping Centre wanted to increase awareness of their dining offer, and convert online traffic to in-centre foot traffic. Innuendo combined a shopping centre activation with an online digital element, to produce the Food Fortune campaign for The Plaza. 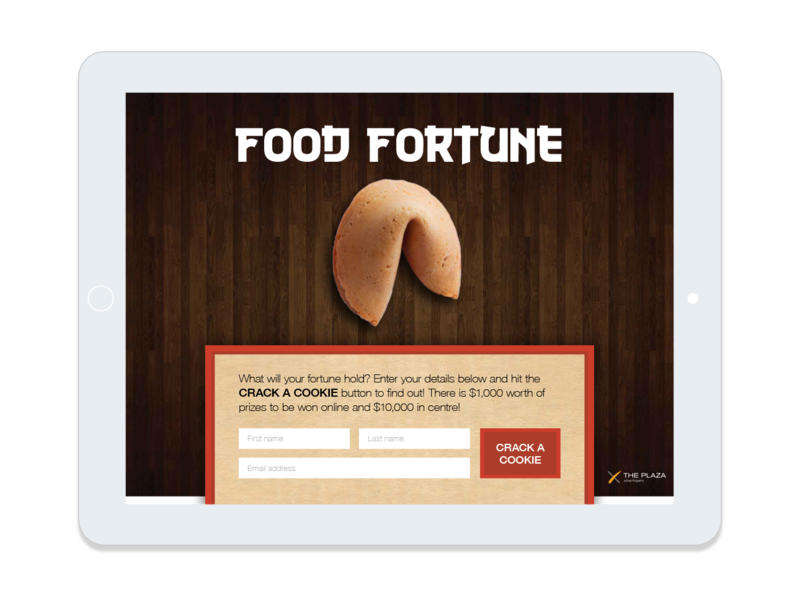 The physical portion of the campaign involved customers exchanging their receipts from food vendors at the purpose built ‘Fortune Shack’ for a fortune cookie containing either a food voucher, or a witty fortune. The process was mirrored online, although no prior purchase was necessary, and the vouchers received were used to drive customers in-centre. Both the instant reward and the shareable fortune helped the organic reach of the campaign. Leveraging the centre’s existing email database to promote the launch of the campaign made sure that we addressed existing customers and provided rewards to both old and new diners. Over the duration of the campaign, Food Fortune received 4781 entries, growing the customer database and spiking foot traffic in the dining precinct.